We've already considered that genuine salvation, according to Ephesians one, is God's plan to bring us to Himself. He is the goal of His saving purposes. But what means does He uses to bring us to Himself? When I consider the dual truths that (1) God is holy, and (2) the the way He operates is equally as holy, I am drawn by His Spirit to evaluate my life (See Leviticus 11:44; Psalm 77:13). Paris Reidhead, in his classic sermon, Ten Shekles and a Shirt, accurately asessed a crucial problem in our religious climate when he spoke against "utilitarian religion," "a useful God," and "expedient Christianity." Reidhead was arguing against the thought of a "Christian" using God as a means for selfish gain rather than the his most desired End. I agree with Reidhead's asessment. But, have you ever felt the weight of God's means to get us to Himself? Notice the litany of verses in Ephesians chapter one that show Christ to be God's means to get us to Himself. As we grow in our awareness of what we are saved from (The Righteous wrath of GOD) and what we are saved to (Eternal fellowship with GOD), then we will increasingly marvel at HOW God has chosen to save us(GOD provided His only Son, Jesus Christ)! We give praise to God for Bethlehem Baptist Chruch. On Sunday, April 23rd, the congreation of Bethlehem voted unanimously to graft Grace Church in to their "Treasuing Christ Together" (TCT) church planting vision, as well as assist Grace Church financially. Join us in saying thank You to the Lord for yet another tangible piece of evidence that the He is calling Grace Church into existence! (Hint: You can copy/paste hymn lyrics from this site). As we've considered (8th Meditation), God was motivated by love to predestine us to adoption as sons (v.5). There is nothing unloving about predestination - it is the work of God wrought in love! BUT WHY? WHAT IS GOD'S CHIEF END, OR PRIMARY GOAL, IN OUR SALVATION? WHERE IS IT ALL HEADING? In a recent post, I asked the question, "Who raised Jesus from the dead?" The overwhelming majority of texts clearly point to God the Father as the answer. Did any of you come across this verse? Seems like the Father and Spirit participated together in the most cataclysmic event in the history of the world. We are still asking the Lord for over 500 intercessors BEFORE we begin the planting efforts this Fall in Memphis. Willing? We all know the second greatest commandment. Here's a site that will help you see if you can keep it. From Naïve...To Arrogant...To "Not so Fast!" 1. No one today is putting out theological treatments like the Puritans (This may be true). 2. No one today is writing anything worth reading for Christians when it comes to theological accuracy and life application. 3. "I must save the day." See the fallacy? (I'm assuming that you also are not interested in being an island unto yourself, but are actually seeking to benefit from the help of others - by reading helpful Christian literature). Thank the Lord for pride-shattering wake up calls, like the one He gave to Elijah in I Kings 19. Maybe you've also been duped by pride into singing Elijah's sob story - only to hear the Lord essentially declare, "I'm doing just fine without you." Well, I'm thankful to now know that MANY are contributing VERY SOLID THEOLOGICAL AND PRACTICAL helps in our day - men who's stature I'll never come close to reaching! And the list could go on! Thank the Lord we are not alone - and more accurately, we're not even leading the charge! Who are some of the contemporary authors who are contributing to your pursuit of the God of the Bible? Jesus is Alive! But, Who raised Him from the Dead? Thank God that Jesus Christ was raised from the dead! We love a living Savior! He has defeated the power of Satan, sin and death! In light of Easter, I was blessed last week in meditating on the resurrection, and wanted to pass along a thought to you. In meditating on the great, and central, truth of Christ's resurrection, have you ever thought about Which Person of the Trinity was responsible for exerting the power that raised Christ from the dead? Before you simply to think, "The Trinity does everything in unison (which is a true statement), therefore there are no distinctions of responsibility within the Godhead (which is a false statement)," it is essential to our faith to know the responsibilities that each Person of the Trinity exercises with respect to our salvation. For example, it would be wrong, and un-Christian, to say that God the Son (Jesus) sent God the Father to die for our sins on the cross. Biblically speaking, that simply is not the case. So, it is vitally important to understand the roles of each Person of the Trinity in order to remain orthodox. So, which Person of the Trinity exerted the power that raised Jesus Christ from the dead? A) Was Christ raised from the dead by His own power? B) Was Christ raised from the dead by the power of God the Father? C) Was Christ raised from the dead by the power of God the Holy Spirit? E) The Scripture does not tell us the answer, and we should not spend our energies trying to discern the matter. In order to provoke others to meditate with you, please supply verse references with your response when possible. Come on, don't be shy. Mark Dever has contributed a wonderful article to Christianity Today on the issue of Christ's Substitutionary Atonement. Like Chad, we would do well to accept our guilt and admire God's grace, to let the Holy Spirit encourage us by the Savior's self-denying love to follow his example, and to savor God's love to us in this almost incredible sacrifice. What did you mean by "almost incredible sacrifice"? Your statement can be taken two ways - 1) Not quite incredible enough to be incredible, or - 2) Very incredible, but believable. The CT article as printed is correct. I was using “incredible” not as “very good” but as “unable to be believed” (as in, ‘this is SO GOOD it is ALMOST beyond being able to be believed’, like when we say something is “too good to be true”). Does that help? Hope you’re well. It was great meeting you. That the God of our Lord Jesus Christ, the Father of Glory, will give the believers a spirit of wisdom and of revelation in the knowledge of Christ. That believers would know the hope of our calling, the riches of the glory of God's inheritance in the saints. That believers would know the surpassing greatness of God's power toward us who believe, in accordance with the strength of God's might - which He exerted in raising Christ from the dead and giving Christ all authority. If this sort of prayer is answered, then surely ten-thousand lesser requests would be met as well! Let's join Paul in praying "big-hearted" prayers for one another as we plead for God to be glorified by Christ being treasured more! Are you thinking about theologically straight-laced passionate devotional singing in Christian corporate worship? Thinking about what you sing, and why you sing it, in corporate worship is important. Below are the links from several well-known Christian leaders who are having an ongoing converstation of sorts concerning a popular song titled, "Draw me close to You." Each author also defends his perspective of what makes a corporate worship song helpful (or unhelpful). First, Chuck Colson's article in Christianity Today started the conversation. Then, Sam Storms "respectfully disagrees" with Chuck Colson's CT article. Then, Justin Taylor agrees with Sam Storms' "respectful disagreement" to Chuck Colson's CT Article. Then, Tim Challies "respectfully disagrees" with Justin Taylor's & Sam Storms' "respectful disagreement" to Chuck Colson's article. Finally, Bob Kauflin responds to all of the responses linked above with his own take on the matter. The Prayer Vigil was a good/bad experience. GOOD: Praying with about 400 others for unborn babies was powerful - especially on the sidewalk of the largest abortion clinic in the Twin Cities. BAD: Seeing a host of Pro-Choice demonstrators on the opposite end of the sidewalk - and several "clients" enter the facility. the children yet unborn,and arise and tell them to their children! Tomorrow morning at 10:30, Lord willing, I will have the privilge of sharing a meditation from Isaiah 52:13-15 at the annual Pro-Life Action Ministries Good Friday Prayer Vigil. The vigil is specifically designed to pray for the unborn, their parents, and those who's vocation is to end the life of the unborn. The vigil will be held on the sidewalk in front of Planned Parenthood, the largest abortion clinic in the Twin Cities. My heart's desire is for people to be saved, deep emotional wounds to be healed, and gospel relationships to be established with the unbeliving. "So His appearance was marred more than any man (52:14); He was despised and forsaken of men (53:2); He was pierced through for our transgressions (53:5); And by His wounds we are healed (53:5); But the Lord was pleased to crush Him, putting Him to grief; if He would render Himself as a guilt offering (53:10); As a result of the anguish of His soul, He will see it and be satisfied; by His knowledge the Righteous One, My Servant will justify the many, as he will bear their iniquities (53:11); Yet He Himself bore the sin of many, and interceded for the transgressors (53:12)"
The abreviation "CCC" is probably used for many things. In my life, for the last 10 years, it has stood for the "Clyde Cranford Challenge." Early in my discipleship with Clyde, he challenged me to know the contents of every chapter in the Bible, or at least the key theme of each chapter. Wow. Needless to say, I've not mastered this challenge yet. The thought has resurfaced in my mind many times lately, so I've developed an Excel sheet that has a space for every chapter in the Bible. Hopefully, I'll be further along next month than I am now. If it were a "closed Bible" quiz, how much of the spreadsheet could you fill in today? Mobilizing churches to be missions-engaged churches is implicit in the Great Commission. The object of "make disciples," in Matthew 28:18-20 is "pante ta ethne" (Translated: "of all the nations"; "of all the peoples"; "of all the ethnic groups"). If a church is content to exist as a homologous unit in terms of her racial, ethnic, economic, and social makeup, then isn't Jesus simply relegated to being that church's tribal deity? If the Jesus we love and worship "doesn't work" for other peoples, then haven't we minimized His global redemptive purposes to fit into our own man-made paradigms? The Perspectives on the World Christian Movement course has served well to mobilize many churches around the world to engage in being a truly missional organism. Seeing the world from God's perspective is integral to loving the peoples of the world with the gospel. Perspectives is a course designed to help Christians do just that - see the world from God's Perspective. We look forward to offering Perspectives, or something similar, as soon as possible at Grace Church. May God be pleased to mobilize many members of Grace Church through the years to engage in planting churches among the unreached peoples of the world! If you were to use this study approach for Ephesians 1:3-14, what would be the dominating theme? There are so many themes repeated in this chapter it may be difficult to discern the dominating theme. Moreover, it is likely that there are several equal dominate themes in this text. Again, there are so many lofty themes presented in chapter one, but these thoughts seem to be the reason everything else in the text happens. Even being chosen (v. 4), and predestined (v. 5, 11), and redemption (v. 7), and forgiveness (v. 7), all flow out of the four themes mentioned above (Which I would argue, are really ONE theme). The theme of Ephesians 1:3-14 (remember, this is one sentence in Greek), is the amazingly free exercise of GOD to predestine, choose, redeem, and forgive His own because of His own "grace," "purpose," and "kind intention" (the KJV renders "kind intention" as, "good pleasure," which I really like better). 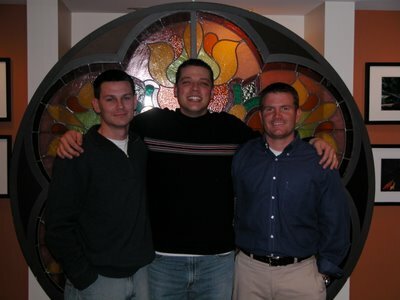 ANCF is the newest church plant from Bethlehem Baptist Church (March '06). They are one month old and God is doing many amazing things in and through this congregation already. Today, in an effort to continue to promote kinship between the two churches, the BBC staff meeting was held at ANCF's rented offices. I thank the Lord for the way "mother" and "daughter" rejoiced in God's grace today! It is such a powerful testimony to see two churches sharing the same vision of GOD and a passion for the lost. I commend to you the ministry of ANCF. You can hear Pastor Sherard Burns' sermons, and find many other helpful resources on their website. We are thankful to the Lord for Bethlehem's role in planting Grace Church, and for our older sister, All Nations Christian Fellowship! The Bible Commentary feature on the Ethereal Library site is very user-friendly. Just type a book, chapter, and verse and hit enter. Immediately there are a number of commentaries at your disposal, as well as several alternate English translations of the verse. Several of the commentaries are very solid. I especially recommend Charles Hodges' work. It appears official. The Thomas family will be closing on a new home in Memphis in May, and moving in late June. Keep the Sawyer's in your prayers as they are trying to sell their home. I'm participating in a two-day Christian Mediation Training Practicum with Peace Maker Ministries this weekend. Excellent training. Several months ago, the Peace Maker Resources informed the Constitution of Grace Church to include several clauses about how to handle conflict within Grace Church in a biblical way. Thank God for His word, and for those who help us to live it! We believe in prayer at home. But, this post is a request for prayer for a home. Nathan & April are asking the Lord to sell their home in Covington soon so they will be able to move to downtown with Grace Church. Tracy & I are praying for the Lord to perform His pleasure with regards to a home in downtown that has piqued our interest. We praise the Lord that Bryan & Angie have been blessed with a rental home in West Memphis, which the Lord provided through friends of Grace Church. ORANYPUNCTUATIONATTHEENDOFSENTENCES. Weird huh? Well beyond seeming weird to us, it probably provided many difficulties in translation. Thankfully, the thousands of existing manuscripts of Greek NT writings have been rigorously scrutinized through the science called textual criticism. The Greek New Testament text used in Seminaries today is a product of this scrutiny, and has been supplied with upper and lower case characters, punctuation, and a footnoted apparatus explaining the nuances found in other existing NT manuscripts. My reason for noting this technicality in the NT is because the punctuation supplied in the Greek Testament has also carried over into our English translations. Ephesians 1:4-5 is an example of a punctuation boo-boo (That's the technical term:). There was nothing else in existence except for the Triune God when He predestined us to adoption as sons through Jesus Christ to Himself (see verse four)! He didn't predestine us because we did something good, or because He "looked into the future" and saw that we would choose Him. He just loved! Because He loved, He lovingly predestined us to adoption as sons through Jesus Christ to Himself! Let the love of our loving God stimulate us to bless Him! 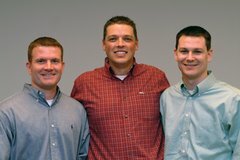 Thank you for your prayers for our pastoral team. We are in the midst of a long discussion pertaining to several minute details related to Grace Church. We are aware of the spiritual nature of all of life, but will be happy when we can devote more attention to matters that we are more engergized about! We sense the Lord's help in our discussions, thank you for your prayers! My oldest daughter, Taylor, and my wife of 95.616448% of 7 years, Tracy, both celebrated birthday's last week. I love 'em! Taylor, your parents love you, and thank God for you! Our chief desire for you is that you will belong wholly to the Lord forever! Tracy, you are wonderful! I thank God for your love for Him and your love for your five children (including Caleb (due in May) and me!)! We've already highlighted this site on Solus Christus. But I couldn't help doing so again! Are you kidding me? There's enough here to suffice for a lifetime of fruitful study! And very solid too! Sam Storms is the president of Enjoying God Ministries based in Kansas City. He's in Minneapolis this weekend and next, Lord willing, preaching at Bethlehem during John Piper's sabbatical. Along with two other pastors from Bethlehem, I was privileged to have dinner with Sam after tonight's Saturday Evening Service and was greatly benefitted as we discussed as wide range of theological topics. He is truly a gift to the Kingdom, and I commend His writings, sermons, and conference ministry to you.